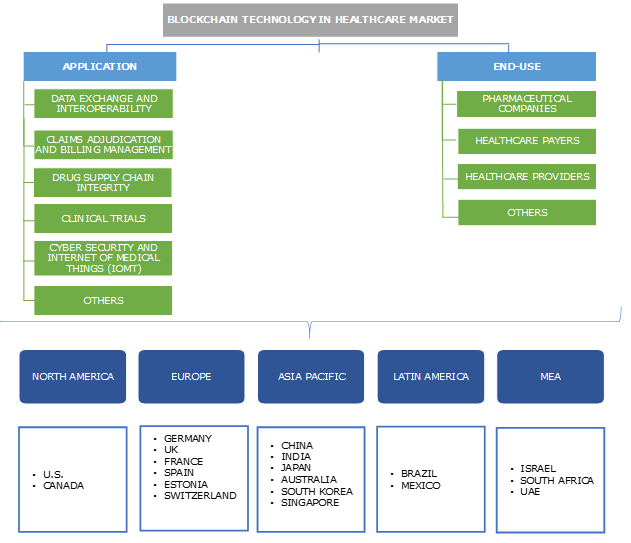 Blockchain Technology in Healthcare Market size was valued over USD 48.2 million in 2018 and is expected to witness 65.0% CAGR from 2019 to 2025. Increasing risk of counterfeit drugs will spur the growth of blockchain technology in healthcare market in the forthcoming years. In the last few years, there has been a steep rise in the number of counterfeit drugs in the market, killing an estimated 1 million people annually. According to the World Health Organization (WHO), around 10% of the medicines across the globe are counterfeit. Also, as per the Organization for Economic Co-operation and Development (OECD), counterfeit pharmaceutical industry amounts up to USD 200 billion. Blockchain technology has several application in securing vast data, decentralization, immutable record-keeping and potential to tackle the growing illegal industry by tracking drug movements. Rise in applications of blockchain technology in healthcare will augment the market growth. Growing incidence of medical data breaches will result in increase in adoption of blockchain technology in healthcare. With the emerging new technologies, there has been increase in number of hackers and other forces devoted to exploiting vulnerabilities in these advancements. Recent advancements in homecare technology has helped provide critical services in improving patients health, but the growing concerns related to data storage and transmission of medical information will result in boosting the demand and adoption rate of blockchain technology, thereby fueling the industry growth. Lack of technical infrastructure in various countries across the globe will be one of the major market impeding factors. In addition, lack of awareness and skilled work force will be other factors responsible for slow growth of blockchain technology market in healthcare. Application of blockchain technology in data exchange and interoperability amounted to around USD 19.3 million in the year 2018. In the last few years, a significant amount of healthcare facilities have adopted Electronic Health Records (EHR), leading to advancements in digitizing healthcare system. Increase in number of volume-based medical practices such as hospitalizations, consultations, prescriptions and procedures have resulted in boosting the demand and adoption rate of blockchain technology in healthcare in order to safeguard the data. Hence, growing digitization in healthcare system has resulted in high demand for interoperability, augmenting the business growth. Application of blockchain technology in drug supply chain integrity will witness considerable amount of growth at 67.0% over the forecast time period. Pharmaceutical supply chain is one of the major verticals that uses technologically driven solutions. However, drug supply chain is vulnerable to several adversities. Growing number counterfeit drugs supply across the globe has resulted in annual loss of USD 200 billion. The application of blockchain such as eliminating fraud, reducing delays from paperwork, improving inventory management, minimizing courier costs, increasing consumer and partner trust, and identifying issues more rapidly will help enhancing drug supply management, boosting the industry growth in future. Use of blockchain technology in pharmaceutical companies was valued at around USD 21.5 million in the year 2018. As per Forbes, pharmaceutical industry is worth USD 466 billion in the Unites States. Increase in concerns regarding clinical trials and drug supply chain management has resulted in boosting the application of blockchain in securing and modernizing the pharmaceutical industry. The use of blockchain technology in pharma companies will help in securing information in clinical trials and clinical research studies. Hence, growing applications of blockchain technology in pharmaceutical companies will further boost the segmental growth. Use of blockchain technology by healthcare payers will witness a robust CAGR of 65.7% over the projection period. The use of blockchain technology by the healthcare payers will eliminate the concerns regarding security violations and privacy. As a result, the technology will help open the patient management systems and electronic health records (EHR) to broad networks, allowing healthcare providers, payers, patients and other stake holders exchange crucial patient generated data and medical information. Hence, implementation of blockchain technology by the healthcare payers will augment the industry growth in the near future. U.S. dominated the North America blockchain technology in healthcare market and was valued around USD 24.8 million in the year 2018. The U.S. healthcare industry has trouble managing large amount of patient information. Medical offices, doctors, hospitals, pharmacies, therapists and insurance companies need several data in order to take proper care of patients. 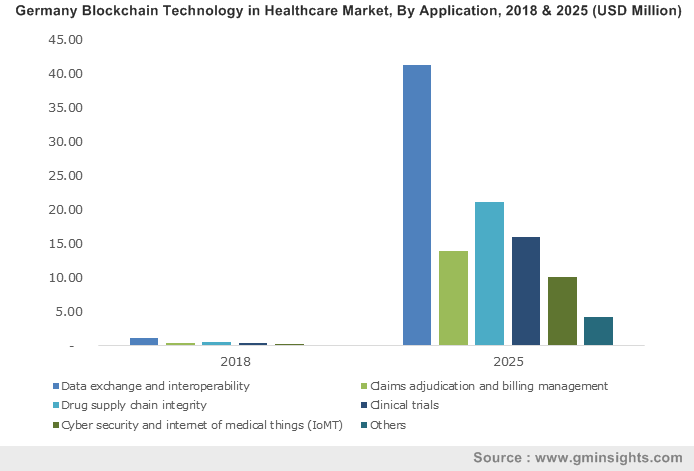 Increase in demand and adoption rate of blockchain technology by the healthcare facilities in the Unites States will augment the market growth in the forthcoming years. Switzerland blockchain technology in healthcare market is projected to grow at 73.3% over the forecast timeframe. Switzerland is one of the most attractive countries for blockchain due to its high level of blockchain knowledge, implementation rate, start-ups to experiment and excellent services. According to a recent research study, Switzerland is one of the most blockchain-friendly countries in Europe. Growing demand and adoption rate of blockchain technology in healthcare in the country will boost the industry growth in near future. Some of the major players in the blockchain technology in healthcare market are IBM, Microsoft, Guardtime, PokitDok, Gem Health and others. The key players are focusing on new product innovation, development and launches. Implementation of major strategies such as merger, acquisition, partnerships and collaborations will help the companies cater to growing demand of major customers across the globe. For instance, in January 2019, Embleema, one of the major blockchain companies in healthcare, announced its partnership with Pharmagest Interactive in order to allow patients to download their health data from healthcare centers and pharmacies. Blockchain technology will have a revolutionary impact on healthcare, forcing completer transformation and digitalization. Pharmaceutical industry is undergoing rapid changes with the help of blockchain technology in healthcare. For instance, storage of various medicines related information has become more secure and easy with the help of blockchain technology. The healthcare industry suffers from the highest number of data breaches, about USD 380 per patient record, that is around 2.5 times the global average as compared to other markets. Growing startup funding, increase in healthcare expenditure across the globe and rise in awareness regarding applications of blockchain technology will augment the business growth. The use of blockchain technology in healthcare in the future will enhance the market growth.